Does your kid want to match Mom or Dad with the coolest biker gear around? 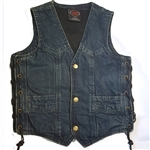 Leather Bound Online has boys leather motorcycle vest & denim biker vests in a variety of styles. 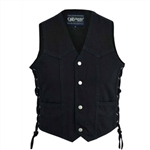 Rest assure that our kids and baby leather motorcycle vests are made from soft quality leather and offer many of the same features that our adult biker vests offer. 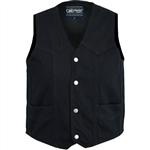 Our kids leather anarchy motorcycle club vest even has a tiny gun pocket inside! Choosing the correct size for your child is not always easy and while we do offer a sizing chart online please feel free to contact us for additional measurements, you can e-mail us at info@leatherboundonline.com and we will be happy to further help you choose the best size for your little biker boy or girl.